One of the reasons a good number of Australians don’t know their own history is the failure of publishers to publish good, readable histories in a form and price that makes them accessible to all. Sean Scalmer’s, The Little History of Australian Unionism is published with this in mind. A compact, complete and up-to-date history, The Little History of Australian Unionism tells the story of the development of Australian unions over the past 200 years. 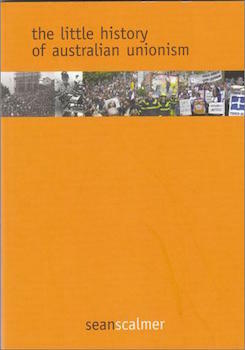 With the support of 13 Australian unions, including major sponsorship by the ETU and CFMEU, the book is aimed at everyone interested in the history of Australian society and the formation of its values and institutions and particularly at students of history as well as unionised and yet-to-be-unionised workers, old and young. Scalmer provides a history of trade unions that is clear, accurate and engaging. He records their achievements, explains how they were won, and provides an invaluable context for the urgent defence of the union movement. Priced at $9.95, and printed in pocket-sized format, The Little History of Australian Unionism is an affordale and portable lesson in the history of a movement that is vital to the future of a decent and compassionate Australian society. “Sean Scalmer’s incisive and engaging account shows how trade unions have made a vital contribution to the improvement of workers’ lives and a fairer Australia. He provides invaluable support in the present struggle to maintain the rights of unions to organise and represent workers. The history of trade unions is more than a record of sacrifice and achievement; it is an account of the lessons of that experience, and a precious resource in mobilising support for the union movement as it responds to the present attack on their very rights to organise and represent workers.” – Professor Stuart Macintyre. A Little History – Rowan Cahill review for Workers Online.